There are many important factors to consider when planning (or even just contemplating) a home renovation, particularly a kitchen remodel. You want to think about your goals for the space, weigh your most important priorities, contemplate functional issues and come up with a vision for how you want the room to look. However, one of the most important issues is budget. Mostly likely, you don’t have the luxury of access to unlimited funds, so you need to come up with a reasonable budget for this project. It’s important that your budget be as accurate and realistic as possible so that you will be able to stick to it. Once you start the project, if you quickly begin going over budget, you will have problems. You may have to eliminate items you wanted, make unenviable choices about which things must be cut from the plan or—worse case scenario—you may run out of money and be left with an incomplete renovation. Needless to say, you want to do everything you can to try and avoid any of these situations. The best way to do this is to carefully plan out your budget, with as much information and research as you can get. There are of course a wide number of variables that can affect the cost of your remodel. In some cases, even just a seemingly minor adjustment in a particular detail or choice of materials can have a surprising impact on the final total. However, there are some basic starting points that can help you start to put together a rough calculation of what you can expect to pay for this renovation. 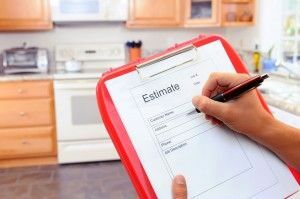 Technology can be your friend here, as there are numerous calculators, tools and apps that can help you calculate various costs associated with your home remodel. You will need to know the square footage of the space, plus as many specific details as possible about the type and style of appliances, countertops, floors and other elements. You can also search the inventory and price list at the websites for large home improvement stores, which can help you determine current prices for the individual materials that will be used in your project. It can also be helpful to consider the value (or potential selling price) of your home as a whole. This can be a useful guideline, as your kitchen renovation cost shouldn’t exceed more than a certain percentage of your total home value, if you want to recoup a lot of your investment. The best resource for your remodeling budget estimate is your contractor, as they have expertise in exactly that area and are very familiar with the price of materials and the likely labor costs you will incur. RW Remodeling has considerable expertise in calculating the kitchen remodel costs in Phoenix, and we can provide a detailed estimate for your next Phoenix kitchen remodeling project.